Details: Following a very chilled 4 days in Mancora, we waited at the bus stop on the main road before boarding and settled into our comfortable Cama seats. As the bus was later in the evening there was no food, and films were shown for half an hour before turning off the lights. We managed 2 hours sleep before being woken up at the Ecuadorian boarder to get our exit/entry papers before heading onwards with our journey. We arrived at Guayaquil bus terminal just after 5am, and decided to get a taxi to the airport to drop our valuables at the lockers before venturing into town. 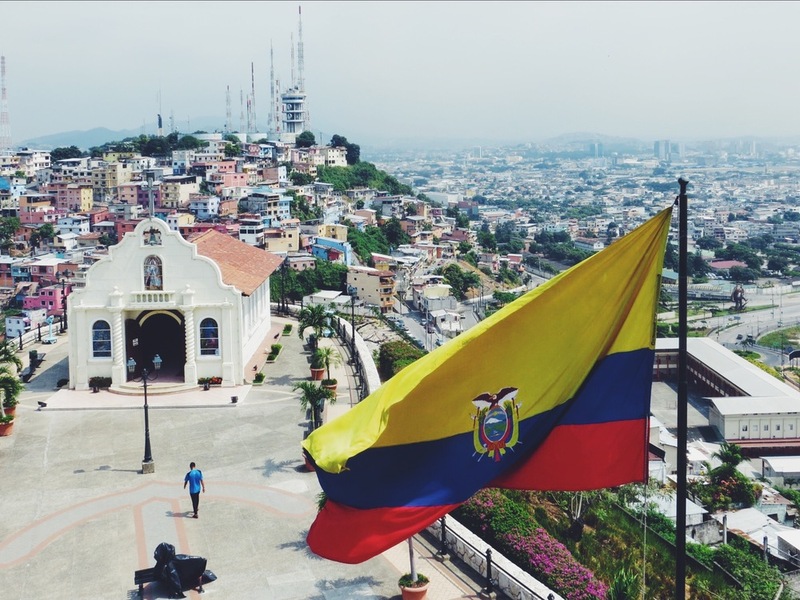 We had heard Guayaquil wasn't the safest city, and didn't want to risk loosing our cameras before the Galápagos trip the following day! Details: We boarded at mid day from the Cruz del Sur terminal after 2 full days in Lima that had been crammed with a lot of amazing food. The downstairs cama floor was really nice, decent seats and our own personal TV screens. We watched back to back films (many were in English) throughout the afternoon and got given dinner (chicken, rice and salad) at 8pm. We thought we were going to be given lunch, so by the time dinner was served we were pretty hungry. Unfortunately on this particular journey we had forgotten to bring emergency rations! We managed to get a bit of sleep overnight and when we woke, the foggy weather of Lima was fully left behind, and we were greeted with blue skies, beaches and sunny weather. We were give breakfast at 8am, and after arriving at the final stop in town we headed to our hostel, looking forward to the surfing lifestyle of Mancora for the next 4 days. Details: After a fun three days sand boarding and chilling by the pool we left Huacachina in the cold early morning mist. The taxi driver dropped us off at the terminal in Ica (we thought he'd ran off with our change, but eventually came back to our relief!) and we waited for half an hour in the terminal before checking in our bags and boarding. We left promptly at 7.30am and settled into comfy, reclining seats. 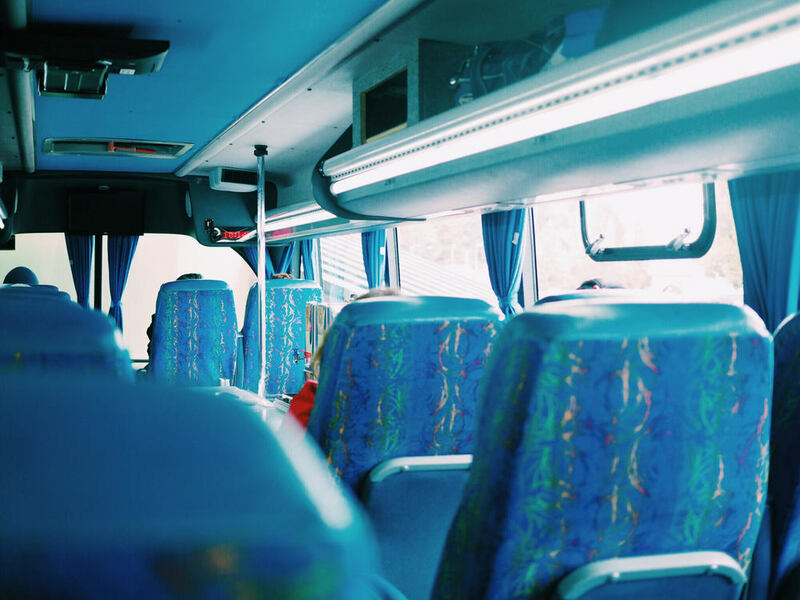 It was only a single decker bus, clearly not meant for long distances but with free wifi on board as well as breakfast, personal TV screens and USB ports, Cruz del Sur continued to make life on the road a little bit more comfortable. It was a short ride (just over 4 hours) which made for a lovely change as we'd had a lot of long bus journeys recently. The buildings and traffic started to get more dense around us, signalling we had arrived in the Peruvian capital of Lima. Details: Following 3 great days of exploring the Colca Canyon from Arequipa, it was time for another night bus to Ica, home to the desert oasis of Huacachina. Unfortunately there had been a communication error with our hostel host and our tickets hadn't been booked before we left on our three day trek, meaning the full cama seats with Cruz del Sur had sold out. We'd been so impressed with Cruz del Sur that we decided that their semi cama option was most likely still better then other companies, and so booked up seats with a local tour agency. We waited in the Cruz deal Sur lounge after checking in our bags at the desk, and boarded 10 minutes before departure on a pretty much empty top deck. As expected, the seats were great and we still received a hot chicken meal at 10pm and a blanket. After our usual routine of trying to sleep for 6 hours we stopped in Nazca at 7am, and were given a cookie and sandwich for breakfast. The landscape had become really arid and mountainous and as we watched the little towns pass us by we could tell we were headed the right direction for the desert. We arrived in Ica around 9am and jumped in a cab to our final destination. After around 10 minutes the incredible sand dunes came into view, and we looked forward to a few days of sand boarding in Huacachina. Details: Being one of our favourite cities of the trip, we were sad to leave Cusco behind. It had been a great launchpad for Machu Picchu, the Sacred Valley and a Jungle trip to Puerto Maldonado. We were impressed to find that Cruz del Sur had its own the private terminal which was very clean and well organised. We had the back 2 fully-reclining seats, massive amounts of leg room, blankets and pillows, and our own touch screen TV. We left Cusco at 8pm and checked the films on offer, some of which luckily had English subtitles. We were also impressed that we had the option of a chicken, beef or veggie meal, which turned out to be surprisingly good. Despite the very comfortable set up we still only managed to get a few hours of disjointed 'sleep'. We arrived around 6am in Arequipa and after checking in to our hostel, were able to head straight to our private room so gave ourselves a few hours proper sleep. Details: After a fantastic time exploring the sacred valley and Machu Picchi we decided to head into the jungle in hope of catching a glimpse of some of the interesting wildlife in the Amazon basin. After a quick cab ride from our central hostel, we paid the bus station tax and starting boarding the bus. We had beers for the road which the security guard unfortunately confiscated, and proceeded to drink minutes later! We had good seats downstairs at the front giving us a bit more space, and after being given blankets we settled in for the night trying to find that 'comfortable' position to sleep. 9 hours and not much sleep later, we were awoken by a passport officer with a huge machine gun. A slightly unsettling way to be woken up! With the doors open we could feel the humidity outside: we had reached the jungle! We arrived at 7am, and made our way to the town centre to be picked up and driven to our jungle lodge. 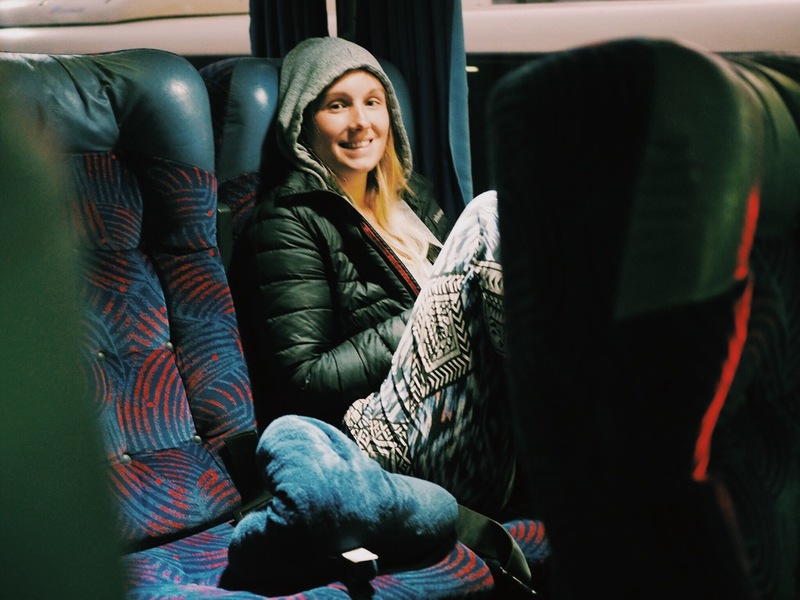 Details: Following our adventures exploring the islands of Amantani, Taquille and Uros, and seeing as there's little to do in Puno itself we took a night bus from the terminal in town. 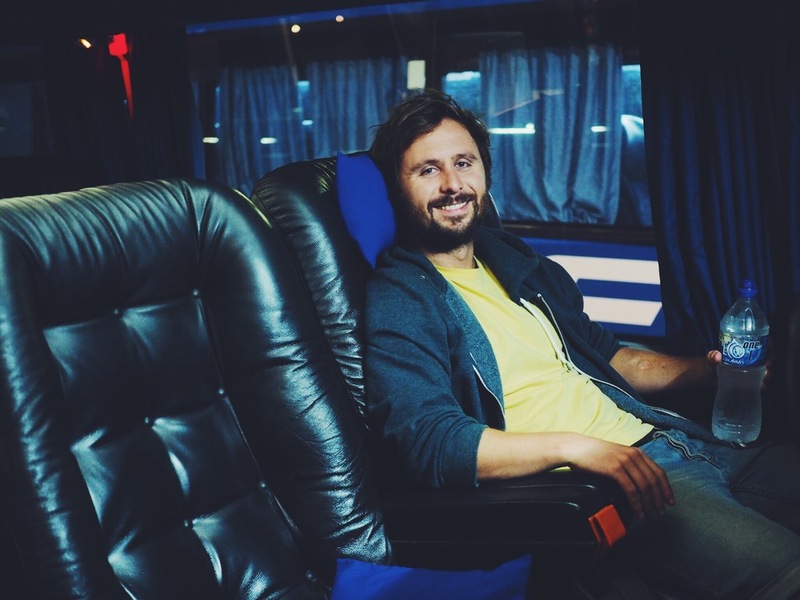 Luckily for us we found the bus had amazing 160 degree reclining seats, which we found to be rare for Bolivia! We were given blankets before we set off, and even had a hot dinner brought to us after about an hour into the journey. We were very relieved to have such a comfortable journey after a week or so of feeling altitude sickness. 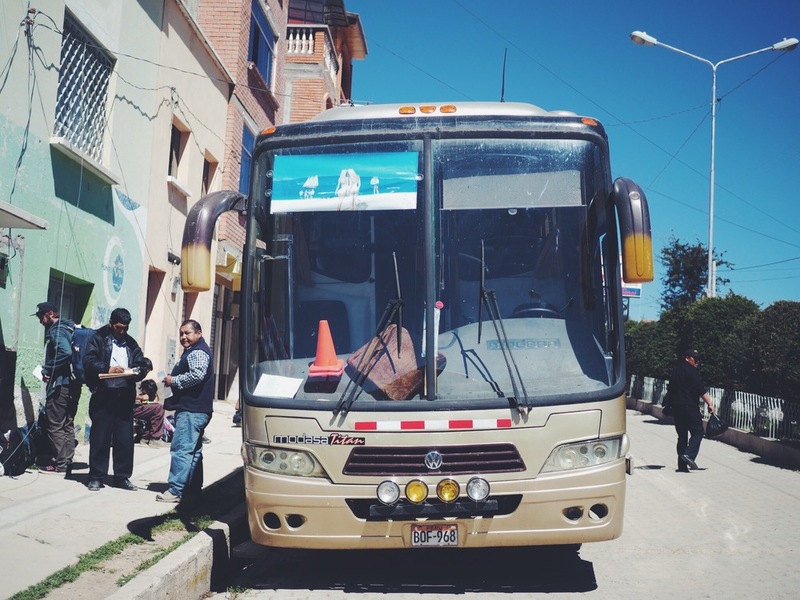 Details: After exploring the city centre and Isla del Sol from Copacabana we took the 1.30pm bus from the town centre towards Puno. By this point the altitude had hit us pretty hard so weren't feeling the best during the journey, but took the time to try and rest up while we could. Once we got to the bus we were greeted by a friendly bus driver called Oscar who helped us sort our seats and bags before setting off. Half an hour later? 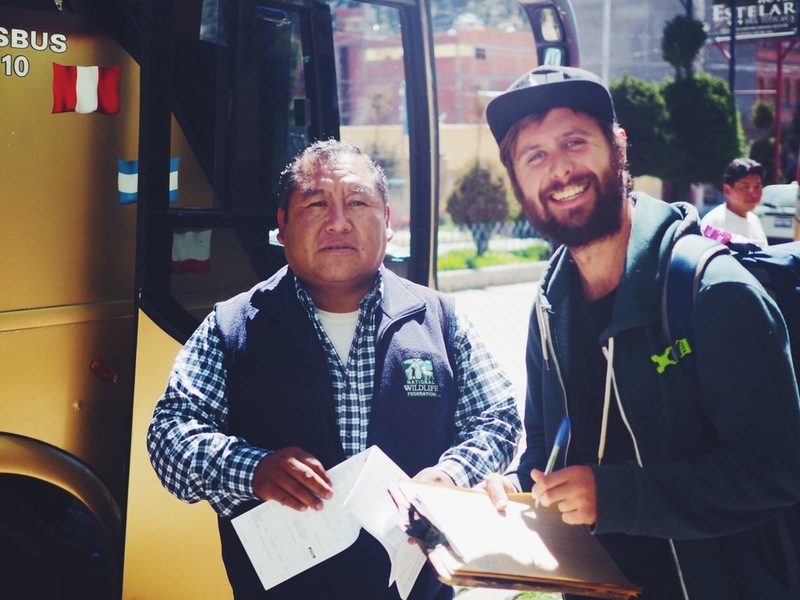 we crossed the border into Peru, The driver Oscar was very helpful again, giving us good tips to change our Bolivianos at the border with a great rate, and invaluable information on getting a bus from Puno to Cusco after our floating islands tour. 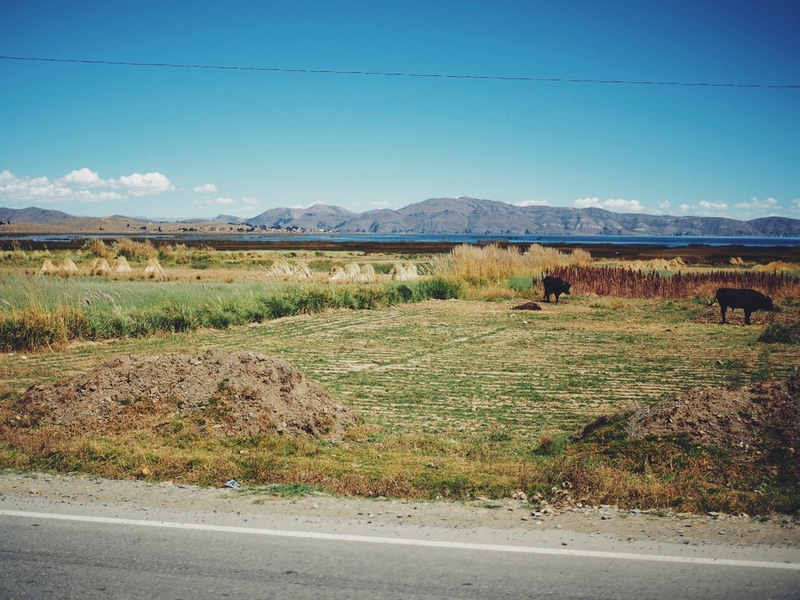 As we made our way we had great views of Lake Titicaca on our right, and saw flamingos and Cholitas working and harvesting quinoa on the farmland. Description: Following a fascinating nature filled jungle tour in the Bolivian Amazon basin we flew back to La Paz and made our way to Copacabana on Lake Titicaca, a small town situated close to the boarder of Peru. The cheapest way to get there is by a local mini bus from the Cemetery General, just north of the city centre. We crammed on with a load of locals and made our way along the windy roads surrounded by towering mountains. As we approached the small town of Tiquina the mini bus boarded a large wooden cargo boat that took us over the lake crossing. The driver kept trying to charge us extra for the stop, but luckily an Argentinian guy who was on the bus with us told us we didn't have to. We continued the last stretch of the journey to Copacabana and arrived at the pretty main square in front of the Cathedral before making our way to a nearby hostel. 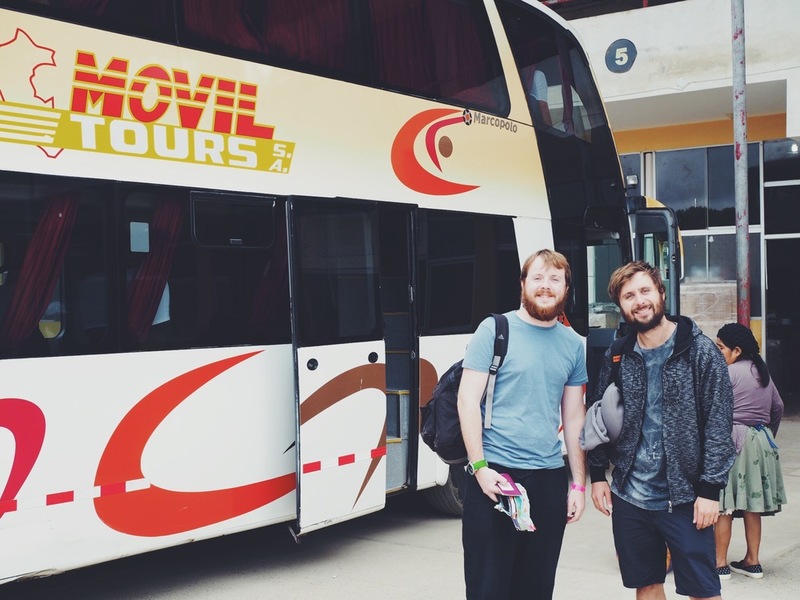 Description: Boarding our first long hall bus journey in Bolivia was definitely a little more stressful than in other South American countries. There was a very strange system of taking your bags up a flight of stairs and down a long corridor to be tagged, before lowering them down by a rope in front of the bus. It was a pretty confusing, and with all the running around and getting tickets and tags we only managed to get on the bus with 5 minutes to spare! Our seats had randomly changed from 27-28 (downstairs) to 1-2, the front seats upstairs, and we weren't sure why, but went along with it anyway. Additionally we were told that Bolivian buses don't offer any food or water, so we made sure we ate and stocked up with plenty before we got on. After the rather stressful boarding, all seemed to go smoothly and we even managed a few hours sleep (after the loud Spanish-dubbed John Claud van dam film had finished). At cx we arrived at La Paz, the second capital of Bolivia situated at 4500m above sea level. La Paz is a convenient (and cheap) launchpad from which to visit the Amazon basin and so it was our next port of call. Details: Our original plan was to get the bus to Sucre, but after finding out how cheap Bolivian taxis are from the lady at our hostel, we decided to take a cab. After setting off we stopped in a nearby square to pick up 2 others also wanting to head to Sucre. The journey was much quicker than a bus, and at 50BOB each (about £5) it was a steal, although the car was a little crowded and we were relieved to be out of it once we got to our hostel in the city centre. 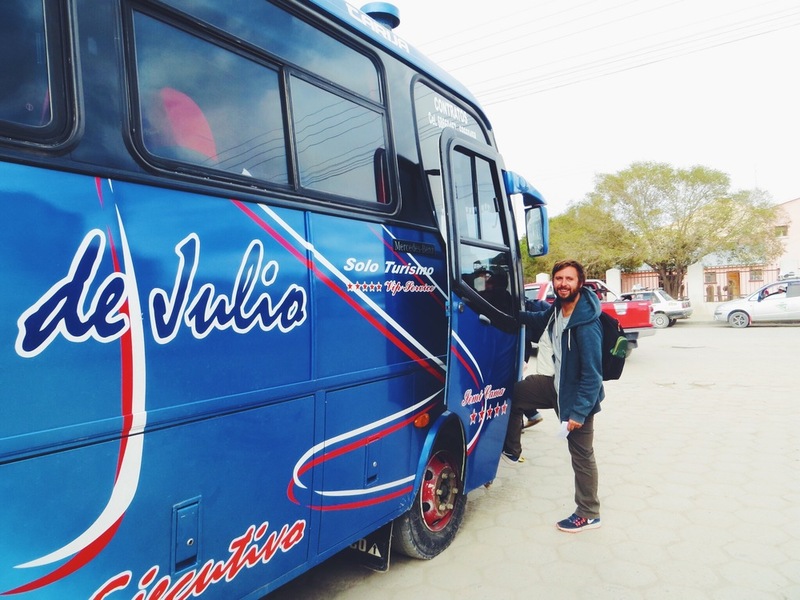 Details: Having just had a truly epic 3 day jeep tour from San Pedro de Aticama to Uyuni, travelling past stunning lakes, volcanos and of course the Salar de Uyuni salt flats, we boarded a small local bus in the town with a group of people we had met on the jeep tour. The bus was pretty basic, and seats weren't particularly comfortable, but it was very cheap. The journey was relatively comfortable due to the new road that had been built between Uyuni and Sucre, and despite the loud Bolivian music that was playing we managed to get some sleep before arriving at the small bus station in Potosi at 8.30pm. Our group then split and we jumped on a local bus to the centre and chose a decent looking hostel near the main plaza. Description: The 3 day Jeep tour from San Pedro de Atacama to Salar de Uyuni was, for us, one of the things we had been looking forward to most during our trip around South America. After a few days in San Pedro de Atacama we finally decided on a tour company (there are loads to chose from, we went with Atacama Mistica). We had heard plenty of horror stories about drunk drivers, and therefore did a lot of research and asked around to make sure that it was going to be safe. You can read more about our experience here. Details: Salta was a great launchpad to see many of the surrounding landscapes including the incredible 14 color mountain in Humahuaca, the Inca ruins of Tilcara and the beautiful towns of Purmamarca, where we decided to stay 2 nights. We used a local tour bus to get from Salta to Purmamarca. On the day of travel we sat on the side of a dusty road and waited for our bus to San Pedro de Atacama. The bus arrival had a window of an hour and a half, but luckily we had a great view of the 7 colour mountain as we waited at our pickup point in the morning sunshine. Once the bus arrived we realised we had front row window seats that gave an amazing cinemaesque view of the Andes. 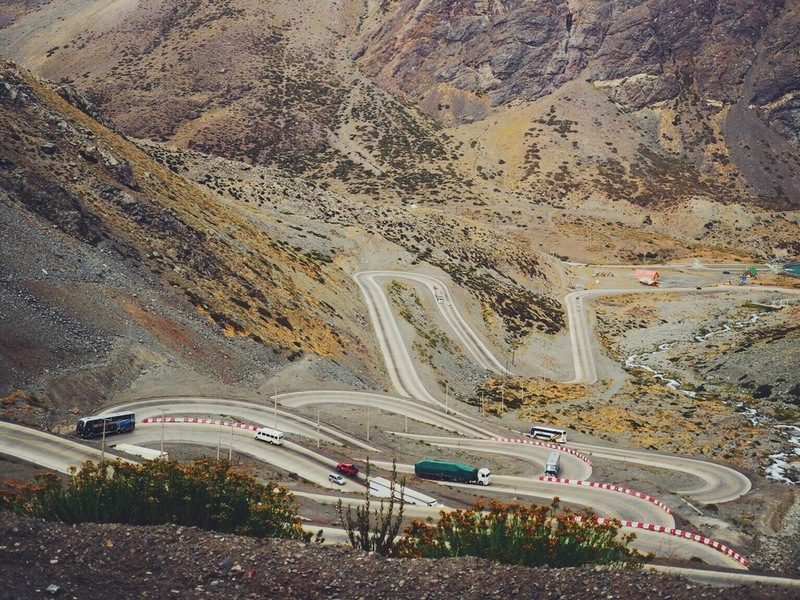 We cut through the towering mountains toward the Chilean border, passing through salt flats, volcanoes and deserts. 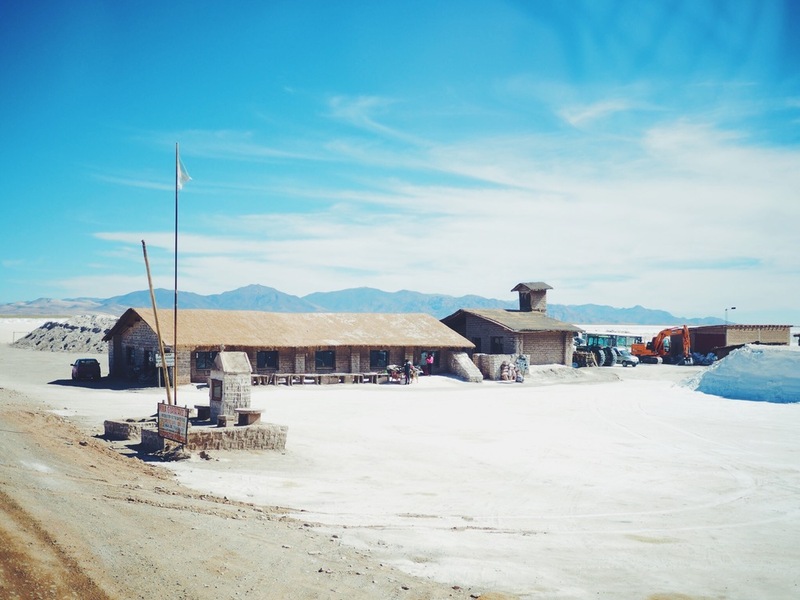 The border crossing was quick and painless, and after a basic lunch provided by the bus company we arrived in San Pedro, the gateway to the Atacama desert and the salt flats of Uyuni. 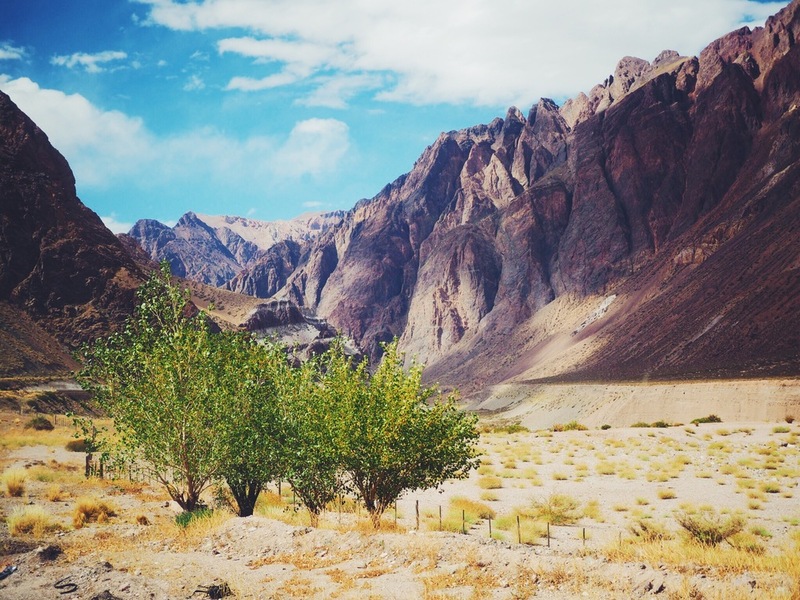 Details: Mendoza had been a bit of a disappointing city for us (besides the great wine tasting) so we were excited to venture further north to the epic painted landscapes of the Salta region. We set off at 8pm on a full-Cama sleeper bus with luxury leather seats, amazing leg room, blankets and pillows. They served wine and food throughout, played films, and we even played bingo with the other passengers to win a bottle of wine! We managed to get a little sleep before we arrived at the Salta bus terminal at 9am. All in all it was a very pleasant and relaxing journey. Description: After a great couple of days exploring the colourful streets of Valparaiso, we boarded the bus at 7.45am and set off for Mendoza. We'd heard that the scenery would be particularly spectacular, so after a couple of hour sleep we watched from our right-hand-side Windows as the epic scenery towered around us as we wound through the Andes. It was time for another border crossing, which took a few hours, but there was a little restaurant, in the middle of the mountains that was selling a tasty Choripán (the classic Argentinean sausage sandwich). After all passport checks were finished we got back on the bus and watched the newly released Revenant which was a nice change from the dodgy Spanish films we had previously encountered. We arrived in Mendoza to warm sunshine, and looked forward to the wine tasting and bike rides in the hilly, green region of Argentina. Description: After spending a great couple of days exploring Santiago, we had heard that there was a seaside town called Valparaiso nearby that we should pay a visit. We jumped on the metro from our hostel and got off at the Pajaritos stop as it's the most convenient bus terminal out of the city. The seats were very clean and comfortable and with decent leg room, and reclined back enough for the short ride. After only an hour and a half the colourful buildings of Valparaiso came into view which made for a welcome change from our previous long bus journeys. 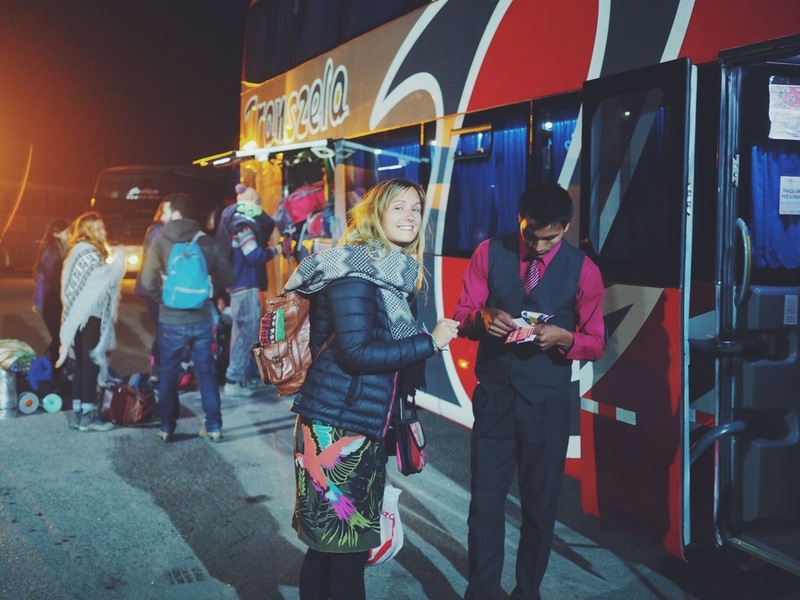 Details: After an amazing stay in Puerto Varas, ending on a delicious fish meal at Casavaldes, we arrived at an empty bus terminal and waited for our 10.30pm night bus to the Chilean capital. The bus was very comfy with fully reclining seats, and as we were at the front (seats 1 & 2) we got even more leg room. Sleeping on night buses is never easy but we managed to doze off for a few hours. We were woken early (6.20am) which was a bit annoying as we still had 6 hours to go, but were given an apple juice and a very dry biscuit while a few new passengers boarded at the city of Chillan, about 200 miles from Santiago. As we approached the capital, the outskirts were quite run down but once we were on their excellent metro system, Santiago began to shine in a far more impressive light. Details: After a 10 minute cab ride from our hostel to the bus terminal we boarded the top deck of the semicama bus to Puerto Varas, Chile. We had bought the tickets the day before, and the guy in the ticket office recommended we sit on the left hand side so we could take in the great scenery including the many stunning lakes and even a volcano! We bought food with us as we weren't sure if we were going to stop on the 6 hour journey, but after 10 minutes they came around with sandwiches. Despite being semicama the seats were a little narrow and not particularly ergonomic, but were fine for the length of the journey. We stopped at the Chilean border at 12pm to get our Argentinian exit stamps, and then half an hour later we were stopped to get our bags checked by the sniffer dogs. The process was much quicker then before and after our passports had been stamped we continued on to Puerto Varas. Details: The bus picked us up from outside our hostel (Rancho Grande) around 7.30pm and took us along a very bumpy road for quite a while. Seats were not too uncomfortable for day travel, but the bumpy roads made sleeping impossible. The air conditioning was minimal but luckily it cooled down once it got dark. We had one toilet stop at 12.30am, but there was no food offered or shops open. We arrived in Los Antiguos at 6am, and after a very quick toilet stop (again, there were no shops open for food) we transferred to another bus at 6.15am. The bus was basic and a little run down but the seats still reclined and there was decent leg room. As it got light we noticed how straight the roads had become, and how baron and uninteresting the landscape was. We took the opportunity to catch up on some writing for our blog, and watched a couple of films on the laptop. We were given a Dulche de Leche treat to keep us going and around 3pm we pulled into another stop and this time there was food for sale. By this point everyone on the bus was starving so there was a polite scramble to get hold of the goods! It was also only a 20 minute break after having spent over 17 hours on buses, which definitely didn't feel like enough. Eventually, the scenery around us became incredibly lush and beautiful and we pulled into Bariloche at 7pm, feeling a little put out that we had had to spend so much money on a below par bus experience but excited to explore the beautiful lakes in the surrounding area.